On February 23, 1899, a factory worker at P.R. Caesar’s Tailoring and Cleaning Plant in Muskogee, Oklahoma, was building a fire, trying to keep warm against the zero-degree day. He poured kerosene over the hot coals in front of him. On contact with the hot coals, the kerosene flared and exploded to fill the factory with flames. The fire soon spread down Main Street and Broadway, decimating the buildings and shops that lined the town’s central arteries. “Brick, stone, scrap iron, smoldering embers are all that remain of the splendid stores, shops, hotels, opera house, and offices of yesterday,” the Muskogee Daily Phoenix, whose offices were built on land purchased from Joseph Sondheimer, later reported. When the volunteer fire department finally quelled the flames, the community gathered at the Sondheimer hide plant to discuss the damage. Joseph Sondheimer, the owner of the hide operation, was a Jew from Bavaria who first passed through the place that would become Muskogee during the Civil War. After secession, Sondheimer won a contract from the U.S. Army to supply the troops stationed at Fort Gibson. He built his warehouse just across the river from the fort. After the war, he converted the warehouse into an Indian trading center for furs, hides, and pecans and moved to area permanently. The town of Muskogee grew up around the warehouse as Sondheimer’s commercial success inspired other white traders to settle there, and by 1872 the Missouri, Kansas and Texas Railroad had been extended to Muskogee. Two years later, the U.S. government established the Union Agency in Muskogee to manage the Five Civilized Tribes, who had been relocated to Oklahoma following Andrew Jackson’s Trail of Tears in the 1830s. This cemented Muskogee as the commercial and administrative capital of Indian Territory, and by the end of the century, land runs, the incorporation of the city, and the convergence of railroad lines in Muskogee resulted in a thriving economy. At the beginning of the twentieth century, Muskogee’s population soared, including its Jewish population. In 1903, the Muskogee City Directory already listed a number of Jewish families. Eventually, most Jewish families in Muskogee were involved in retail trade, opening stores in downtown. Harry Kirschner came to town in 1905 and opened a store. Later, Kirschner got involved in real estate and the oil business. By 1913, Samuel Stolper had opened a cheap used clothing shop called the New York Store. Later, it became the “Boston Store” and sold regular dry goods. His son Phil later became a partner in the business. Roswell Susman moved to Muskogee in the 1920s and opened a high-end ladies' clothing store. Brothers Sol and Maurice Klar opened a jewelry store in 1922. In 1932, Samuel Futterman, Frank Kahn, Leo Epstein, and William Ginsberg all owned department stores in Muskogee as Jews became a significant part of the local merchant class. Others, like Alex Unger and Nathan Ginsberg, owned scrap metal businesses. Joe Yaffe opened a scrap yard in Muskogee which later, under the leadership of his son Robert, became the headquarters of a large scrap metal business with 18 locations in Oklahoma, Arkansas, Missouri, and Kansas. As Jews became established economically in Muskogee, they began to create Jewish organizations. In 1905, Muskogee Jews first held religious services, borrowing a Torah from Kansas City. By 1907, Muskogee Jews had founded a B’nai B’rith lodge. Around that the same time, they began to discuss establishing a congregation. 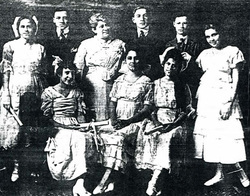 In 1910, they organized Beth Ahaba, which was named for another Beth Ahaba Congregation in Richmond, Virginia, where the Rosendorf family lived before coming to Muskogee. The Richmond congregation gave Beth Ahaba in Muskogee a Torah on long-term loan, and with those scrolls, the Jews of Muskogee started holding services in the living room of Herman and Carrie Fist, whose daughter, Helen, was superintendent of the Sunday school. The congregation was officially chartered in 1911. The burgeoning Jewish community bought land for a burial ground within the city’s Greenhill Cemetery. The first burial there was of Abraham Gremm, in 1911; prior to the cemetery’s establishment, Muskogee Jews would bury their dead in the Jewish cemetery in Fort Gibson, about ten miles away. Jacob Landwirth, an Austrian Jew who ran a general store in Muskogee, was said to have ridden the train to Fort Gibson with the dead body of his baby daughter Elaine. In 1916, the cornerstone was laid for Beth Ahaba Temple. Money for the construction of the building was raised through donations from the Jewish community of Muskogee and their business connections, including suppliers and manufacturers from as far away as New York City, Milwaukee, and San Francisco, reflecting the far economic reach of such a remote city. 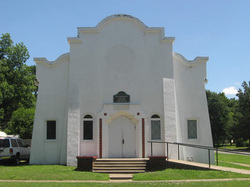 Non-Jewish Muskogeans, feeling a sense of camaraderie with their Jewish neighbors, also gave money to the congregation; the First National Bank of Muskogee was a large donor. From its founding, Beth Ahaba was a Reform congregation, holding its first confirmation ceremony in 1916. By 1920, the congregation was a member of the Union of American Hebrew Congregations. By 1919 the Jewish population of Muskogee had grown to 225, though the congregation did not have a full-time rabbi. Instead, it usually relied on student rabbis from Hebrew Union College in Cincinnati. During the Great Depression, when the congregation could no longer afford a student rabbi, prominent Muskogeean Alex Unger, who had trained as a rabbi, became the lay leader of the congregation. Most of the Muskogee Jewish community belonged to congregation Beth Ahaba, which held services in English and Hebrew, but the desire by some people for a more traditional, Hebrew-only service led to the establishment of the Orthodox Beth Israel Congregation in 1918. By 1925, the Orthodox congregation was meeting regularly in a building at the corner of 9th and Denver Streets. By 1935, the congregation had ten member families. Because it was so small, Beth Israel was not able to establish a Hebrew School or employ a shochet to provide kosher meat. Members with children sent them to Beth Ahaba for religious school. In 1938, the congregation built a new, Spanish Mission-style synagogue on the same site, which still stands today. Although the congregation lasted until the 1970s, it never had more than 25 members, and towards the end the congregation had to bring in male worshipers from Tulsa on holidays to make a minyan. “The temple,” however, “had a different type of Jew,” according to Philip Stolper, son of Samuel and former president of Beth Ahaba. This difference in outlook and observance led to “a separation” between the temple and synagogue crowds, although some people, including Jacob Landwirth, belonged to both. The Reform Beth Ahaba was the only Muskogee congregation to ever retain a full-time rabbi. In 1940, the Beth Ahaba Sisterhood sponsored 32-year-old Rabbi Max Nussbaum and his family as they fled Nazi-controlled Berlin. Rabbi Nussbaum arrived in Muskogee without having mastered English, but soon became fluent enough to deliver lectures across Oklahoma and Texas. Nussbaum served the Muskogee community full-time until 1942, when the Sisterhood’s money ran out, and the rabbi and his family decamped to Temple Israel in Hollywood, ending Muskogee’s only period with full-time rabbinic leadership. Nussbaum eventually became a rabbi to the stars, overseeing the conversions of Elizabeth Taylor and Sammy Davis, Jr., and served as national president of the Zionist Organization of America. Although Muskogee’s international rabbi was gone, the world made its way to Oklahoma during World War II, as nearby army training base Camp Gruber filled with recruits, many of whom were Jewish. In response, an office of the Jewish Welfare Board opened in Muskogee, which for several years hosted Passover seders for up to 1,000 people, both soldiers and civilians. But when the war ended and the boys went home, Muskogee lost the resources that the Welfare Board had brought with it, and the Jewish population was again greatly reduced. Around the same time, Samuel Sondheimer retired and closed the family business started by his father Joseph 80 years earlier. By 1953, only 22 Jewish families remained in Muskogee. By the 1980s, as Muskogee’s young people moved on and the old guard passed away, Beth Ahaba’s membership shrank. Beth Israel had already sold its Spanish Mission-style synagogue to the Reformed Baptist Sovereign Grace Church. The rest of the block where Beth Ahaba’s building stood was owned by the First Baptist Church of Muskogee. In 1983, Beth Ahaba agreed to a property swap, giving First Baptist free reign of the block on 8th and Okmulgee Streets in exchange for church-owned property at 7th and Boston. As part of the deal, First Baptist agreed to build a new synagogue for Beth Ahaba, which incorporated the stained glass window, cornerstone, candelabras, and ark doors from the original building, along with the Eternal Flame that used to hang at Beth Israel. The church and the temple held a joint dedication ceremony, continuing the tradition of cross-cultural partnership once so necessary to survival in the undeveloped West and now ingrained in the culture of Muskogee. Beth Ahaba's second temple, built in 1984. After the new temple’s dedication, Beth Ahaba centered around a small but committed congregation, helped along by three recent converts from Tulsa who became integral to the temple community. In 2007, with a small congregation of about ten members, Beth Ahaba found itself back in the local news: a homemade bomb of cooking oils and other volatile materials was found outside the temple. The Muskogee Phoenix denounced the incident and editorialized that, “the fact that it happened reflects very poorly on our town, even if it was the work of an individual. Those of the Jewish faith have been a part of our town since its founding, and the temple has been a part of Muskogee longer than many Christian churches. Jews have contributed to our community in innumerable ways, despite their few numbers.” The article noted that a Nazi symbol had been painted on the temple a few years earlier. Despite these isolated instances of anti-Semitism, the prevailing attitude seems to have been one of cooperation. In early 2011, the Muskogee Phoenix ran an article on the Muskogee Cooperative Ministries, a body of religious organizations, including Beth Ahaba, committed to providing aid to the underserved Muskogee community. Muskogee Jews have always been very involved in the larger community. Miriam Freedman directs the Kirschner Foundation, named for her stepfather, which supports local projects and causes. The foundation has funded a library program to teach computer skills as well as education programs for female prison inmates. The recipients of the foundation’s grants range from the Muskogee Little Theater to the Children’s Adoption Network in Denver, Colorado. In 2011, Temple Beth Ahaba finally closed. The congregation had aged and dwindled so much that it was almost never possible to put together a minyan. The temple’s Torah, borrowed a hundred years earlier from its namesake in Richmond, was returned. The congregation donated many of the temple’s artifacts to the Sherwin Miller Museum of Jewish Art in Tulsa, where they ornament a replica synagogue housed inside it. Today, there are few indications that Muskogee was ever home to a large and vibrant Jewish community. Aside from the cemetery, a handful of names on plaques and sides of buildings—Unger, Stolper, Sondheimer— and the two former synagogue buildings are all that remain. Muskogee had Oklahoma’s first Jews, but it won’t have the last. Stolper, Daniel. 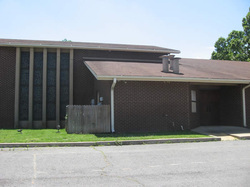 “Congregational History – Temple Beth Ahaba – Muskogee, Oklahoma” in OzarksWatch, Vol. XII, No. 1 & 2, 1999, pp. 27-32.